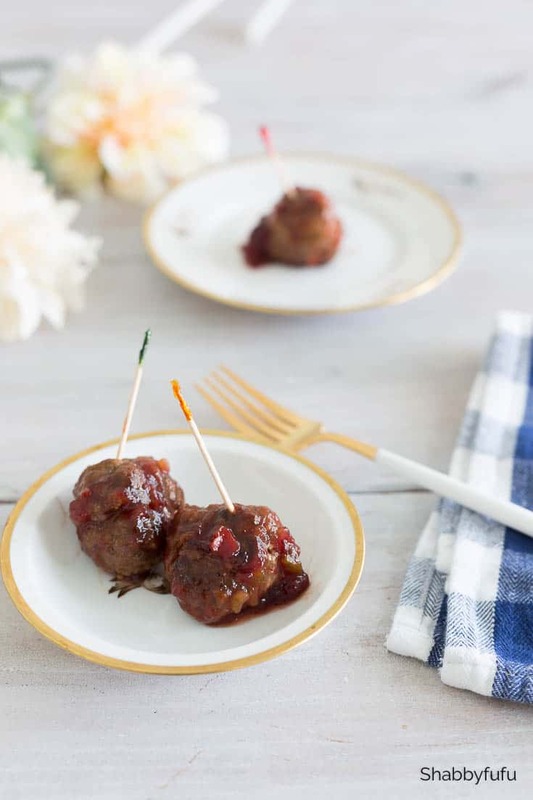 Cranberry meatballs with chili sauce are easy to make and the perfect party food! I got this recipe from my mom and recall her making it when my parents had friends over. She was a working mom with three kids and not much time for cooking from scratch, but this is just so easy! I generally reserve this dish for fall and winter and sometimes make a comfort food meal out of it and at other times serve it as an appetizer when we entertain. I’m joining in the Tastes Of The Season Holiday Recipe Series hosted by my talented friend Kristen of Ella Claire. Be sure to scroll down and see the delicious recipes that everyone is sharing today. There are several cooking methods that I use for making any meatballs, but my own favorite is baking. Another way to cook meatballs that I use is by putting them in the slow cooker, especially if I’m going to be out for the day. You can use ground turkey, ground chicken or beef and they all taste great with this sauce! 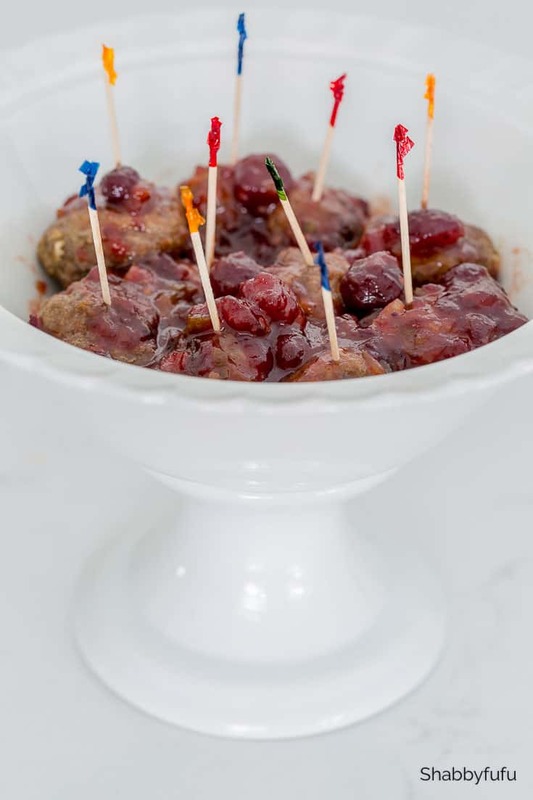 Making the meatballs into little balls of about 1 1/2″ allows them to be the ideal size as a one bite finger food. Served as an appetizer, just insert cocktail toothpicks and allow your guests to grab a tidbit or two. It’s not a messy food that way and at parties, who wants to get sauce down their shirt?! Serve them in a large bowl or chafing dish if you have one. When I planned and hosted my daughter’s wedding reception last spring I ordered THIS CHAFING SET and it’s handy to have for small events. In my area, tapas potluck parties are popular and this would be something that I’d bring along. 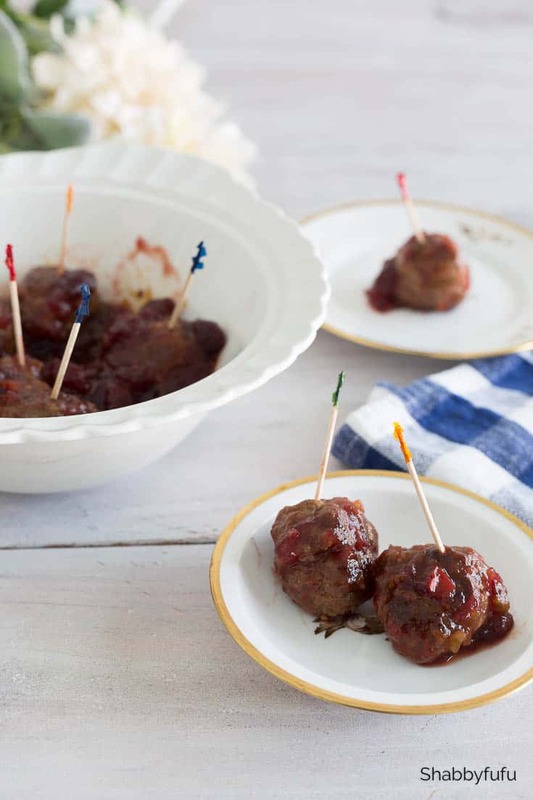 Make a big batch and did you know that you can freeze your meatballs after you cook them? 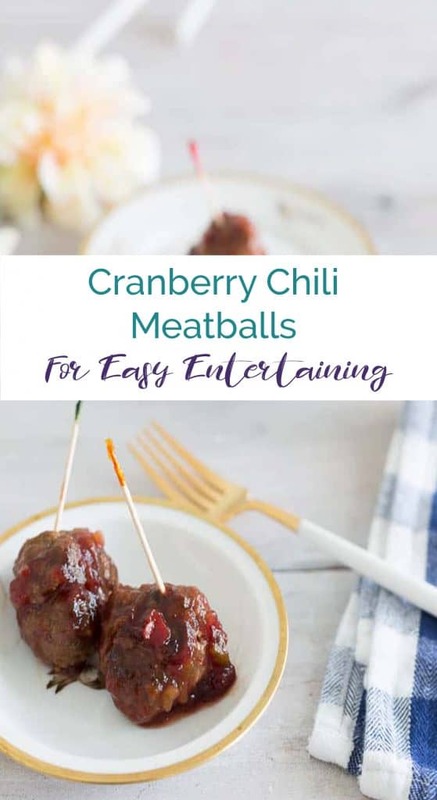 They are so handy to have around for those rushed nights, and the cranberry meatballs with chili sauce are delicious served over rice! 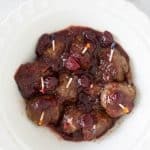 A light lunch with a couple of these cranberry meatballs and a small side salad and my recipe is gluten free and Keto friendly. 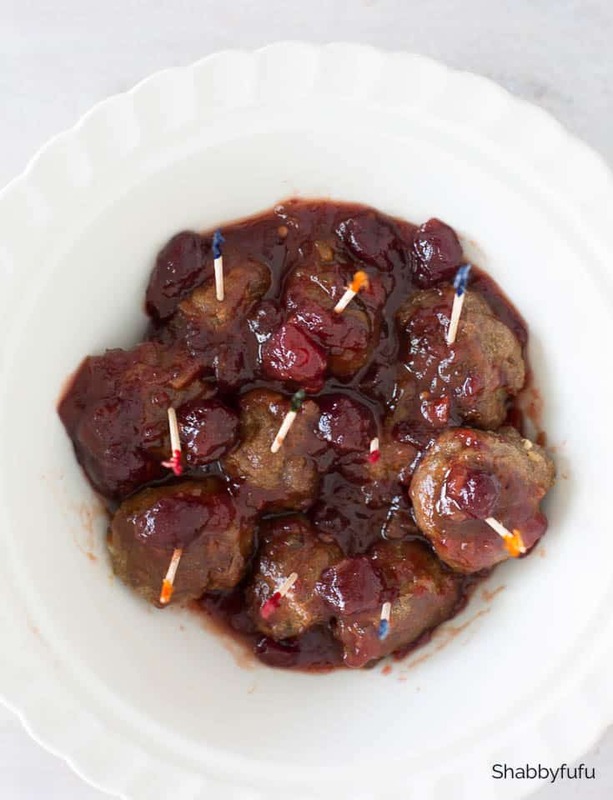 Cranberry meatballs with chili sauce for dinner over pasta? Yes please and since I do gluten free I use THIS PASTA that is made with corn and rice flours. Easy to prepare party meatballs that are savory and sweet. Serve as appetizers or make a family dinner poured over pasta. Mix ground meat with 1/2 cup gluten free breadcrumbs. Substitute regular breadcrumbs if preferred. Mince 3 cloves of fresh garlic and mix into the meatballs (optional). Form meatballs that are about 1 1/2" round. TIP* Use an ice cream scoop to measure for even sizing. Using a non stick baking pan, bake for about 30 minutes in an oven that's been preheated to 350 degrees. Turn over after about 15 minutes for even baking. In a medium bowl, mix cranberry sauce with chili sauce. Add cooked meatballs to sauce and simmer until ready to serve. PIN FOR LATER and please visit my friend’s posts for more recipes below! You can find several brands without sugar at Whole Foods. This will be on our dinner table tomorrow. 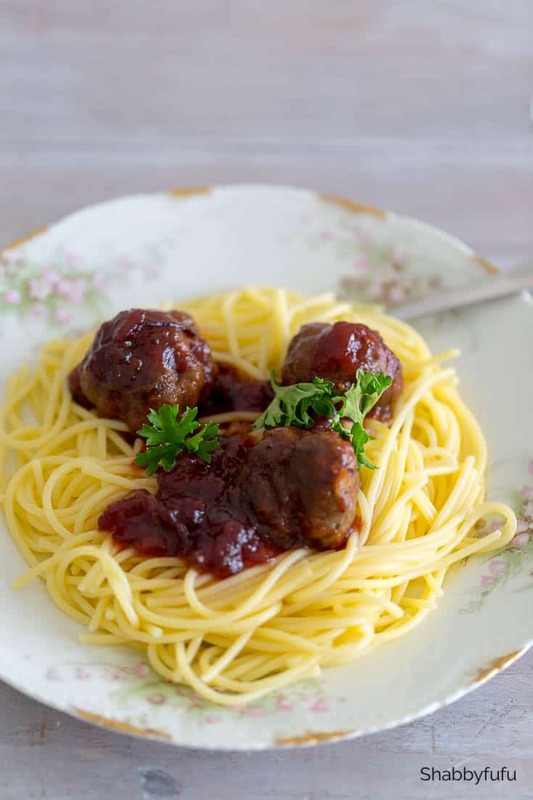 Thank you for sharing these amazing, mouthwatering looking meatball. Yummmmmm!! These look so good and so flavorful! Thanks for sharing!! This looks so divine. Thanks for sharing such a wonderful recipe.